If you are in the market for new steel buildings, NY residents, you have come to the right place. Alan's Factory Outlet has a large selection of steel buildings that can improve the value of your property. Imagine having adequate storage for your vehicles, yard care equipment and seasonal items that are always getting in the way. Not only will your property look better but you will be protecting your belongings from the elements. Steel Buildings in New York are delivered & installed free of charge in NY. The steel buildings in New York are built using steel tubing 4' on center and fully braced. Wherever we distribute our steel buildings, NY or any other state, we are certain that the building you purchase is made to withstand the conditions in that area. Steel buildings are sturdy construction, and when they are built to specifications particular to your area they can be very long lasting. The weather conditions in any area can affect the durability of your steel buildings. NY sees some extremes in weather during all seasons of the year. Rest assured that our steel buildings are up to the challenge. New York steel buildings are custom built in the size, style and leg height; with your choice of sizes for garage doors, there are options for garage doors that will work best with whatever you plan on storing in the steel building. With a little planning you can make sure that your steel building will suit your needs now and in the future. A steel building can be an excellent addition when you do not want to build a permanent structure on your property. Construction costs can be high. An Alan's Factory Outlet steel building will save you money and time. Once you have chosen the proper size for your steel building you can continue to customize your selection. You can choose the color of the walls of your building as well as a matching or complimentary trim color. You can even choose the color of your roof from our color palette, on the steel buildings in New York. Before you make your final selection be sure to check with your local area for permit requirements. Each municipality has regulations that must be followed. These regulations and any necessary permits are the responsibility of the purchaser. Alan's Factory Outlet delivers and sets up your building. We will make you aware of the delivery date of your new steel building. At that time you will need to make certain that the land is prepared and ready for the building to be constructed. 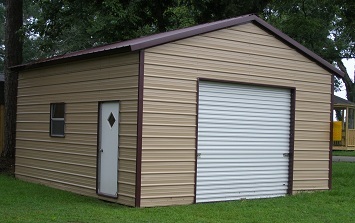 Metal buildings are built on site in one on day giving you an easy fast turnkey metal storage building solution. The metal garages in New York are delivered in most of NY but not in all locations, please check with us to see if we service your location.